You are here: Home / Blog / How big should my brewery be? How big should my brewery be? How many square feet do I need for a brewery? How large of a facility should I get? As the host of a podcast about how to start a brewery I have spoken with over 70 brewers, brewery owners, and other experts in the craft beer industry. So I often hear this question from listeners around the world. Just the business model plays a major role in deciding how many square feet you’ll need for your brewery. As you could imagine, there is no one-size-fits-all size requirement. It’s a tough question to answer, but an important answer to find out. If your brewery is too small, you’ll be crowded for space. “We did not anticipate the need for more cold storage or bigger brewing system,” says Patty Elliot from Pecan Street Brewing in Johnson City, Texas. And if your brewery is too large, you waste precious money on the startup cost for square footage that won’t be used. Yet, with craft beer’s explosive growth that doesn’t seem to be letting up anytime soon, you’ll likely be expanding operations not long after opening. 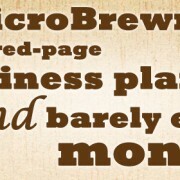 When MicroBrewr founder, Joe Shelerud asked 61 brewers in late 2013, “What do you wish you had known before starting your brewery?” nearly 20% of the responses were that they should have planned their expansion from the start. 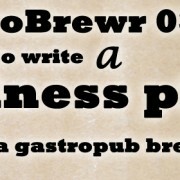 If you read the books about starting a brewery and online beer forums, you can find magic formulas to tell you how big your brewery should be. JVNW’s website has a lot of information and brochures with specifications and resource requirements. As a manufacturer of brewing equipment, they work with a lot of different breweries in a huge variety of configurations. Incidentally, JVNW says the average staff requirement is 0.75 staff per 1,000 barrels of yearly capacity. Whereas, Lakewood Brewing, the one who recommends 1,000 square feet per barrel of brewhouse, has 22 staff for about 10,000-15,000 barrel production. So about 1.76 staff for every 1,000 barrels—roughly double what JVNW recommends. So my takeaway is just that the stats vary greatly. 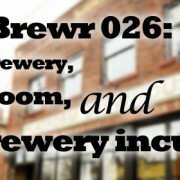 To get a handle on exactly what the square footage requirement is for a small craft brewery, MicroBrewr Podcast listener, Akhilesh Pandey dug into the stats from the show notes. Another podcast listener, Peter Stillmank from Stillmank Brewing Co. in Green Bay, Wisconsin, asked for these stats to get a better picture of our discussions in MicroBrewr Podcast. At episode 41, I started asking for specific statistics including: size of the brewhouse, number of vessels, annual capacity, and square footage. For this exercise, we were concerned only with how many square feet are required for a small craft brewery. So Akhilesh dug into the numbers and plotted them into a spreadsheet. He compared each brewery’s annual capacity to its square footage, and calculated the square footage per barrel of yearly capacity. Well, we looked at the data from 20 different breweries from all over the U.S. plus one 1 in Ireland. (We had to leave out a few due to incomplete data.) Models include everything from a tiny nanobrewery in the basement of a hotel, all the way up to a large production brewery with international distribution, and everything in between. 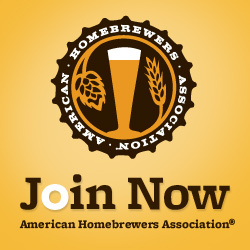 We’ve spoken with nanobreweries, brewpubs, and production packaging breweries. If we take the total square footage for all breweries and divide it by the total yearly capacity of all breweries, it equals 0.8 square feet required per barrel of yearly capacity. This gives sort of an industry-wide efficiency, but it doesn’t really look at what each brewery is doing on an individual basis. Craft beer is a young industry. It’s home to a wide variety of players with varying levels of experience, knowledge, and preferences. So the range of their space efficiency is extremely wide. When we calculate the square footage per barrel of yearly capacity at each individual brewery, the maximum was 40 square feet, the minimum was 0.2 square feet, and the average (mean) was 4.6 square feet per barrel. That seemed kind of high. I thought maybe the average was being skewed by outliers. So I checked the median. The median is 1.6 square feet per barrel of yearly capacity. Median is often used to calculate skewed data sets. It sort of cancels out those outliers like the nanobrewery that uses a whopping 40 square feet per barrel produced, and the brewpub/production brewery that somehow blasts out a full barrel of beer for every 0.2 square feet they occupy. Now, I’m not a mathematician, I don’t recall much from Statistics class. But Akhil has more insight to offer. Akhil looked at the “standard deviation” (I remember that term from Statistics class) and found that those few data points that are just so far from the others, don’t really help us. They’re considered oddballs. By taking off the 3 outliers from the end, Akhil can get 99% confidence in his calculation. With 99% confidence, we can guess that your brewery would need 2.16 square feet per barrel of yearly capacity. How much space do you need for your brewery in planning or for your next expansion brewery? First figure out how many barrels of beer you plan to be able to produce per year, your total capacity. Then figure on needing about 2.16 square feet per barrel of yearly capacity. 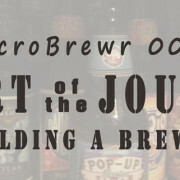 Special thanks to longtime MicroBrewr Podcast listeners, Peter Stillmank and Akhilesh Pandey for your help on this post. Image showing Blueprint by Will Scullin on flickr (CC BY 2.0) was modified from its orignal state. 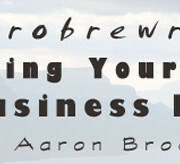 https://microbrewr.com/wp-content/uploads/2015/10/how-big-should-my-brewery-be.jpg 280 750 Nathan Pierce https://microbrewr.com/wp-content/uploads/2013/12/Logo3-Copy1.gif Nathan Pierce2015-10-05 04:00:202015-10-03 19:05:09How big should my brewery be? Hi Nathan. This is a great article. You have some excellent data here that will help a lot of breweries in planning. A question for you: When calculating square footage per barrel of yearly capacity, how many brew cycles per week are in the calculation to determine yearly barrel capacity? When many small breweries open, they may only be brewing a few times per week. That’s 2 per week x 50 weeks per year = 100 sessions per year. As they grow, this will increase. They can reach a max. of 2+ batches per day, 7 days a week. 14 brews per week x 50 weeks = 700 sessions per year. Now that is a cranking brew house! For a 15 BBL brew house, this could be 1,500 to 10,500 BBLs yearly production. That is a huge difference. This is why planning for expansion is critical. Using your 2.16 S.F. per yearly BBL production, this 15 BBL brew house brewery could start with 3,240 S.F. minimum. But could need 22,680 S.F. at max. production. For comparison, of the almost 40 breweries we have worked on to date, our average S.F. per yearly BBL production is 3.1. Albeit, with conservative production numbers. As production grows, I agree that 2.16 S.F. per yearly BBLs is a great planning number. It is important for any new brewery to determine how may brew sessions they will do per week. And, how that number will increase as demand for their product grows. And as you stated, your business model (tap room, distribution, etc.) can have a large impact on how much space you need. Specific Mechanical has a great formula for calculating annual production and the number of tanks it will take to get there. Another great article. Keep it up! Dustin, thanks for the kind words and for your contributing thoughts. As you said, annual production capacity is a factor of the size of brewhouse and the number of batches per year. Number of batches per year is limited by the quantity of fermenters available. That article you linked looks pretty helpful for calculating that requirement. In basic planning, I figure maybe 2-week fermentation cycles. So 6 fermentation tanks would allow 3 batches per week: brew one day, bottle the next, take the weekends off. 10 fermentation tanks would allow 5 batches per week, brewing every day, and dedicated staff bottling every day. All this is pretty simplified, assuming that fermenters are the same size as the brewhouse, there is enough staff to package the beer as fast as it’s being brewed, there’s enough floor space to do the work, etc. To complicate matters more… If fermenters were twice the size of the brewhouse, two batches per day could fill one fermenter, the staff could do multiple batches per day by working longer shifts or rotating shifts around the clock–variables are endless! gahh This study is just to find a basic calculation for early planning purposes. phew haha Thanks for your comments! Opening a brewery plant is not a matter of some days. It takes months for its proper installation. For example, if we think of microbrewery floors, we always look for the best contractors available in market to get the work done in a professional manner. Amazing information and extremely critical when planning a brewery. I also believe that in addition to project planning and optimizing start-up costs and future expansion, you need the right equipment to provide your customers with a beer as was intended by the brewer. I must say it should be like Brutopia, Montreal. It was just a fantastic weekend last week with my friends over there. I like their services, their beers and sandwiches. definitely recommended. Thanks, Ravi. I’d love to visit Montreal some day! Does the 2.16 number include tap room space? Also, are these numbers still viable? Matt, thanks for checking in. The numbers are based on survey respondents’ answers. 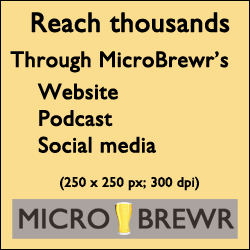 For each episode of MicroBrewr Podcast, I ask the guest from a brewery what their square footage is. You can find individual data points on the show notes for each episode, starting at episode 041. Great article Nathan. I’m also interested in an answer to Matt’s question. 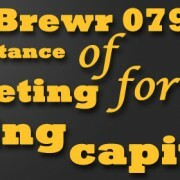 Do you know if the brewpubs surveyed were including their seating space when quoting their square footage? Most of the square footage was reported as a one number; I don’t know whether it was seating space and production space. So for the 2 that did report separate numbers for seating and production space, we erred on the safe side and left out seating. That was episodes 041 and 070, which were 600 sq. ft. and 3,000 sq. ft., respectively. This exercise is meant as a guide, it shows the average across a wide spectrum of business models and brewery types. There are too many factors to give a one-size-fits-all answer. Run your own numbers, do you own research, and let us know what works for you. It is really a fantastic artical! A novice in beer brewing industry could have a very good understanding before they started to establish a new micro brewery. This is Laura from Jinan Tiantai Beer Equipment company. We mainly manufacture the turnkey beer brewing equipment and export to various countries all over the world. Generally if our customers have building or location drawing, our technician team will help to design you the suitable layout accordingly. Both of the 2D and 3D tank drawings are also available. 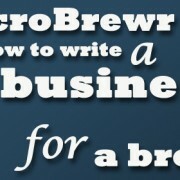 Feel free to visit http://www.craftbreweryequipment.com http://www.microbrewerysystem.com to learn more! That’s interesting that a brewery should have 0.5 to 1 square feet per barrel of yearly capacity, so the more barrels they produce the more space they’ll need for them. I thought the space needed would be determined by the machines that would be needed, but it makes sense to go by barrels since that’s where all the brews will be stored. This would be good for people who want to build their own brewery to know so they would make sure they have enough space and not too much. Hazel, you’re absolutely correct. A brewery must certainly have space for the brew equipment and storage capacity, as well as other operations. A number of factors go into size requirements. Additionally, size requirements greatly vary depending on layout, operations, etc. We looked at square footage required per barrel produced because it normalizes the many factors and because it’s sort of an industry standard, a few other estimates have also looked at this way.